The solution given for the problem of the white and black marbles is flawed. We are dealing with combinations here and not permutations. Once a white marble is drawn, it doesn't matter if it was the first or second marble. There are only two possible outcomes at this point and therefore the probability is one in two. The solution for the problem of the goats and new car is similarly flawed. At the point that the one goat is shown, there are only two possibilities remaining. Changing your pick will NOT increase your probability of winning the car. The probability of your original pick DOES change once the one door is opened! If you are referring to the Monty Hall problem then switching is definitely favorable. Just tree the problem. A long time ago Marilyn Vos Savant made a big stir when she caught a bunch of people making a mistake on this problem. The problem first pops up in a statistics journal circa 1958. I quite agree with your last member. The options are only that it is a white or a black marble, because whether or not you have already selected marble 1 or two from bag A the next outcome is a white anyway. Are you referring to this: Bags of Marbles - Solution ? I agree this answer is wrong it says the answer is 2/3 because you are picking marbles not bags. That answer is if you were picking bags. The probability of you picking a white marble is 3/6 or simplified 1/2. You have the wrong answer posted. Do you have a method for generating random events with known probabilities (eg. Excel) ? If so, then try simulating this a large number of times. Maybe it will help to change your mind. Or study Bayes Theorem and probability tree diagrams. The problem is called Bertrand's box paradox. There is another neat solution on wikipedia. Does the original problem state that the marbles are distinguishable or not? Distinguishability makes a big difference in the way probabilities turn out. Could it be that the 1/2 comes from indistinguishability and the 2/3 from distinuishability? The solution in post #5 appears to assume distinguishability. Some other important concerns in probability: Repetition vs not, replacement vs not, the sample space for the problem. Probability can be exceedingly tricky! Writing "pretty" math (two dimensional) is easier to read and grasp than LaTex (one dimensional). LaTex is like painting on many strips of paper and then stacking them to see what picture they make. I think the probability stays the same in both cases. Did you look at the Wikipeadia article on the Bertrand's box paradox. Yup! I looked at the Wiki article. But alas I haven't had time to really think about it all. I'm helping a friend move most of today. Bob thank you for the pointer. Once the goat was revealed I am essentially asked to pick between 2 remaining doors with only one car between them. What makes one more likely than the other to contain the car? Let's say I originally picked door 1 then door 2 was opened showing the goat so we want to calculate probability of car behind door 1 given that door 2 has a goat and probability of car behind door 3 given that door 2 has a goat. As of now while I am not able to find a flaw in the logic that ends up with the answer 2/3 I also can't see any flaw with the logic above that ends up with 1/2 for an answer. Can you? Actually scratch that I think I do see the flaw in the official answer. Your first choice has a 1/3 chance of having the car, and that does not change. The other two doors HAD a combined chance of 2/3, but now a Goat has been revealed behind one, all the 2/3 chance is with the other door. The flaw is in the assumption that the 1/3 probability of car behind the door that you originally picked stays as 1/3 after the goat was revealed behind another door. So let's say I picked door 1 but now door 2 opens and there is a car behind it would you still claim that probability of a car behind door 1 remained 1/3? The first statement of the official answer is saying that P(c1)=P(c1|g2). Which is incorrect. 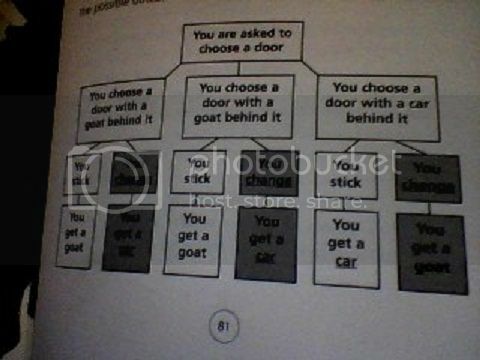 The problem is that door 2 might have a car behind it and not a goat. The game show host knows where the car is. When he/she reveals what is behind a door, this is not a random choice. It has to be a goat door and that's what makes all the difference. If the first choice (1/3) was the car door, then either remaining door can be revealed, and the contestant will loose the car if a change is made. But if the first choice was one of the goat doors (2/3) , then the host has to reveal the other goat and a change means a certain win of the car. Thank you for your response, it is more convincing than the one in the official puzzle solution, but I am still unclear about where the flaw in my logic is. I did know that the host didn't chose the door at random and I don't think I made any assumption about that in my logic. That was me arguing for the flaw in the official answer - not a good argument. But I do not see a flaw in my argument for the "alternative" answer (my first post). Do you? Neither side knew or maybe Marilyn did that this was published in a rather famous Statistics journal circa 1975. It contained Marilyn's proof. When you tree this as she did and the statisticians before her did you will see she is right provided Monty knows where the car is. The role of Monty is underestimated by many. Even the great Paul Erdos could not believe the answer! Even the great Paul Erdos could not believe the answer! I cannot blame him. It is very counter-intuitive! I got it wrong too, proving that bobbym = Paul Erdos. That was all I needed to convince myself that I belonged in math. After all, if I could get the same wrong answer as him I must be great too? I began to search for other probability problems that I could get wrong and lo, I found them. Anyway, it is too bad that no one remembers the movie "Let's Make Love" with Yves Montand and Marilyn Monroe. In it Marilyn sings the "Specialization" number. How does this relate to anything in particular you might ask? I am glad you asked that question, you see when I saw how easily Marilyn Vos Savant did the problem by treeing it I changed the wording of the song to Computation, computation, you'll rule the barnyard if you compute, whoo hoo hoo hoo. So what was wrong with your Bayes? (i) A door is picked. (ii) The host reveals a goat behind another door. So let's say you pick a door. ps. I prefer tree diagrams to Bayes as it is easier to see what is happening without specialist knowledge and tree diagrams are much more versatile (you can have many events and more than two outcomes at each stage). From The Curious Incident of the Dog in the Night-Time by Mark Haddon (2003), published by Vintage (2004). That is my favorite book but I do not have that diagram?! Did Chris speak about it? Your edition of the book is probably different from mine; mine was published by Vintage. In that chapter of the novel, the narrator proved the Monty Hall problem in two ways: using the tree diagram, and by Bayess theorem. The problem seems to be counter-intuitive to me too. Though I understand the Monte Hall, this version is harder. However, now since the immediate requirement is to know who is right and who is wrong, we need to resort to some bobbym philosophy, i.e, experimental verification.